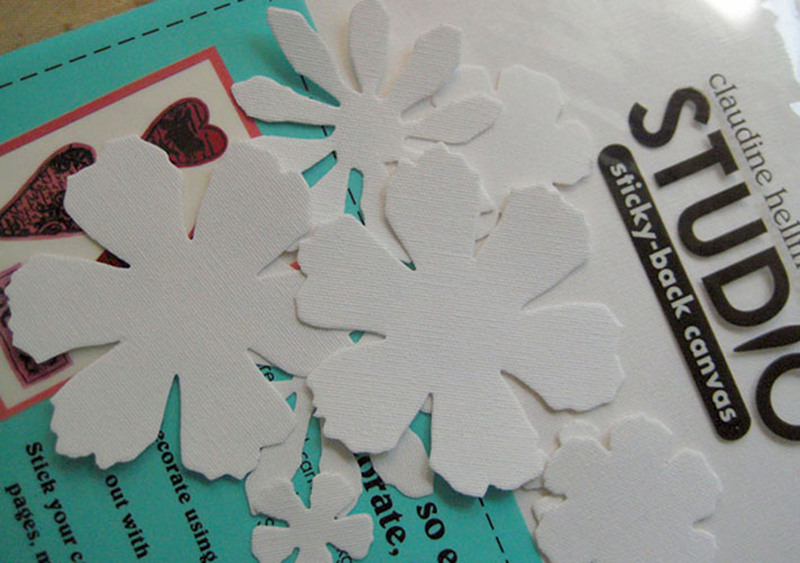 I cut the sticky-back canvas with the Tattered Floral die twice (so I have two of each flower on the die). Next I cut six sets of flowers from the tulle and four sets using from the organza; this is done easily by folding over the fabric and cutting several layers at once. Cut one larger flower from the Grungeboard. I spritz the canvas flowers with the walnut spray and set aside to dry. I could use a color spray – it’s just to give the canvas side of the flower some color – but prefer the vintage look. When my flowers are dry I peel off the backing (one flower at a time) and place the flower sticky-side up on a piece of copy paper. 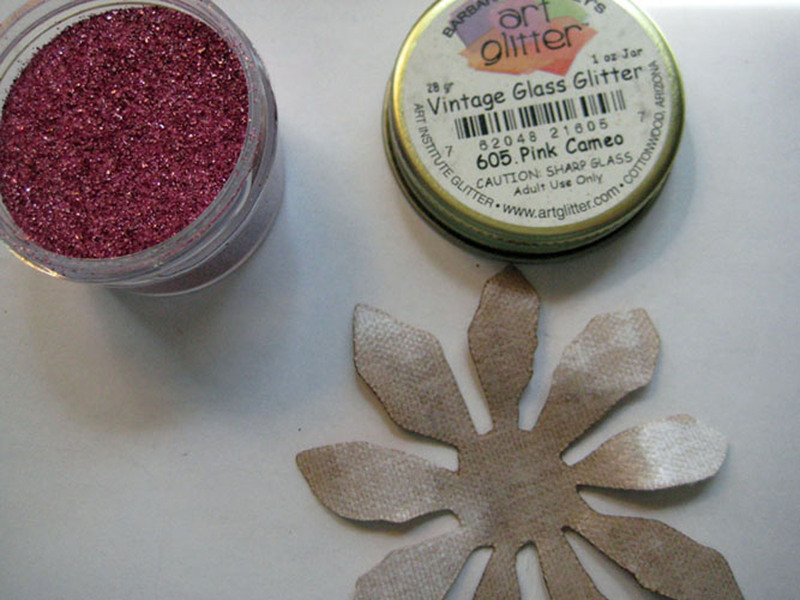 I then spread a generous amount of Pink Cameo Vintage Glass Glitter over the sticky flower and use the brayer to really set the glitter into the canvas. I tap the excess glitter off and put it back in its container. I repeat these steps until I have coated one complete set of flowers and I set them aside. Now I repeat those steps with my second glitter color, completing my second set of glittered flowers and set them aside. I stab my button through the button holes with my tweezers to so I get a good hold on it. I spread a thin coat of Designer Dries Clear over my button and dip it into the Pink Cameo Vintage Glass Glitter and set it aside to dry while I assemble my glittered canvas brooch. 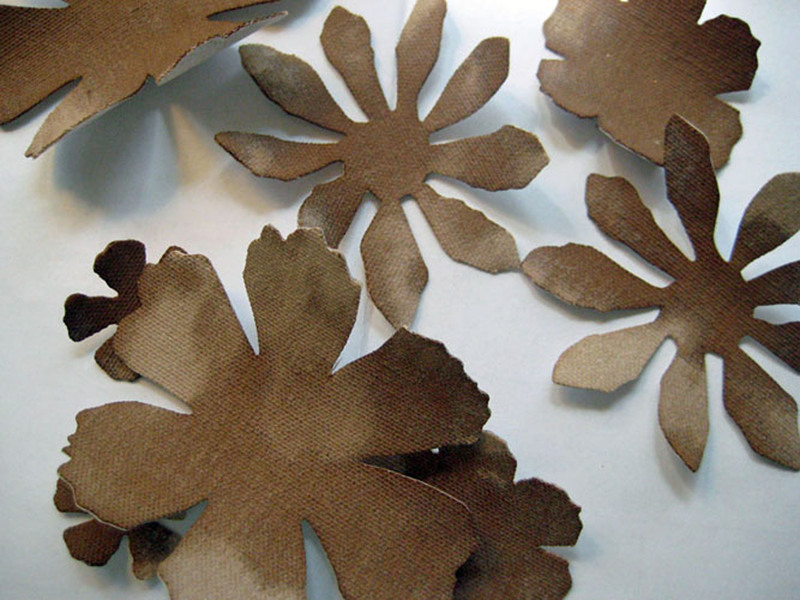 I draw a thin line of Designer Dries Clear (I always, always use the fine tip with my DDC) just inside the outer edges of the grungeboard flower and glue one of the large glittered flowers to it – glitter side up and press to secure. Then I pierce a hole in the center of this piece with a piercing tool and insert the stick part of the tie tack through the glittered side first so the pin comes out on the grungeboard side. I add a small drop or two of DDC to secure it in place and give it a pinch so the glue sets securely. 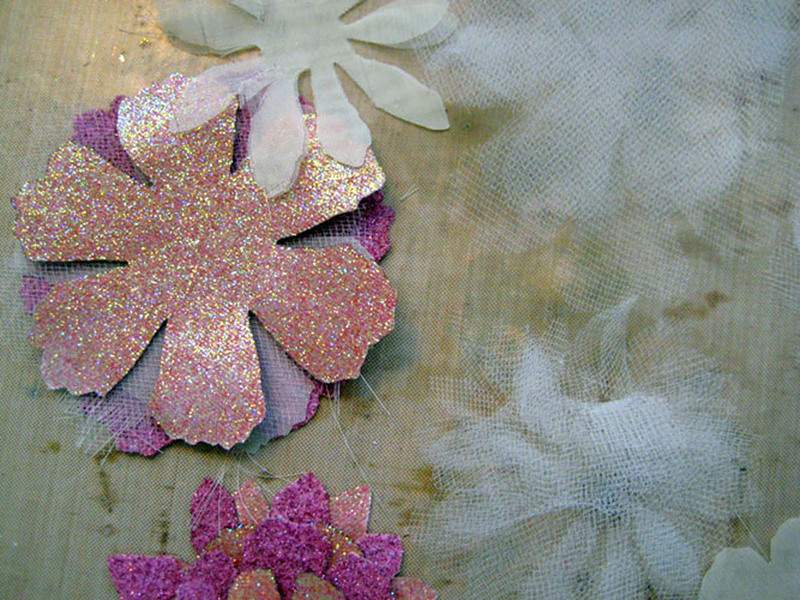 Now the fun begins as I layer the flowers (canvas, tulle and organza) on top of this bottom piece in any order I want – I ran largest to smallest and alternated glitter colors, twisting flowers slightly so petals overlap and fill in the gaps. I use my needle and thread to attach the button to the center, sewing through all layers and grungeboard to secure. I find a thimble really helps here. I stitch through the layers at least three times, pull the thread securely and tie off on the bottom. I casually fluff the layers with my fingers so they have a little lift and definition. They layers will naturally fluff out more with wear and start to look really time-worn and very cool! I prefer to wear my glittered canvas brooches on jean jackets (the colors really pop on the denim background) and I always get compliments on them. 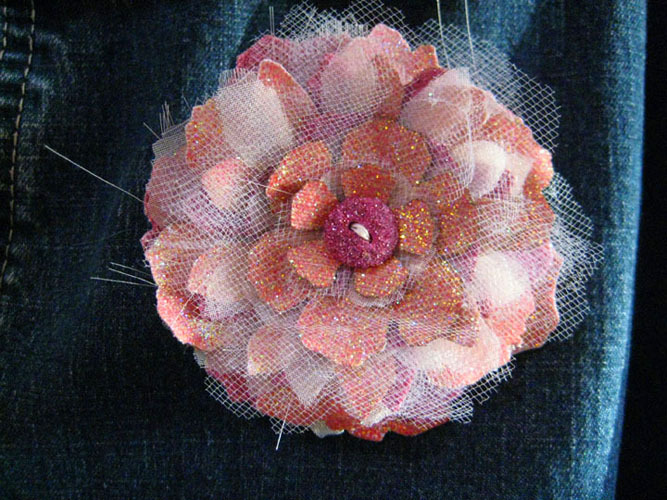 They’re so fun and easy to make and they can easily be converted to fit headbands, wrist cuffs or ponytail holders. The glitter really adds depth and color to the brooches which shows through the layers of tulle and organza for a sparkly shabby chic look! 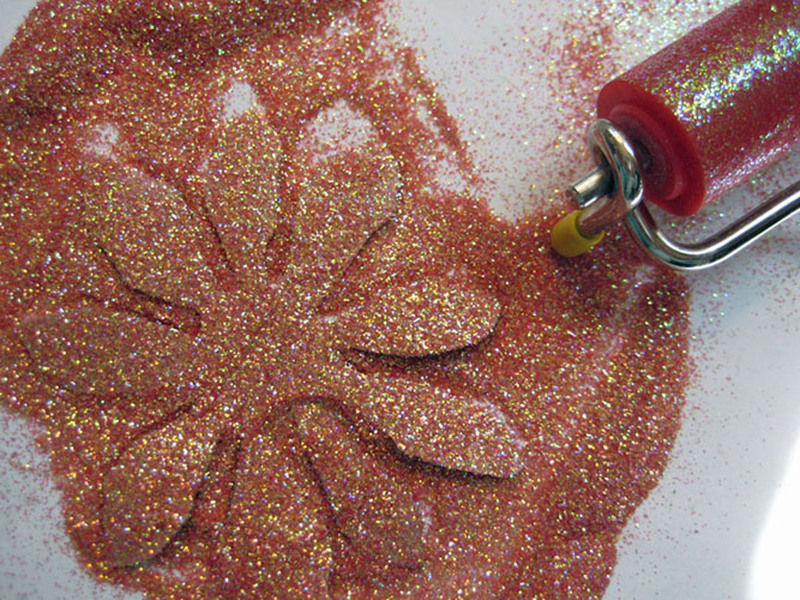 Hop on over to the Art Glitter blog to see more projects by the team! Fantastic! I might have to pull my walnut crystals out! Awesome as always … going to make one for mothers day! It may have to be a project this weekend! Oh yes! Make one – they are so easy and so much fun to wear. I get so many compliments on mine! Thanks! And, good for you! You’ll have so much fun – they can be fun and girly or vintage shabby chic, classy – whatever style you want! Happy birthday to your daughter! She’ll love it. Then you can show her how you did and she can make some for her friends. And, wouldn’t these be cute on a headband or hat? How fun~! This is great!